Representatives of BPI Family and World Bex “honk” a symbolic steering wheel to launch this landmark partnership. (From L-R) Mr. Joseph Ang, Chairman of Worldbex Services International; Mr. David Sarmiento, Jr., BFSB SVP and Head of Auto and Motorcycle Loans; and Mr. Herbert Tuason, BFSB VP and Head of Product Marketing. Bank of the Philippine Islands will celebrates its 160th anniversary this year and, as the leader in Auto Loans, BPI Family Savings Bank is co-presenting the 2011 Manila International Auto Show (MIAS) slated on April 7 to 10, 2011 happening at the World Trade Center in Pasay City. “We pioneered the Auto Madness 13 years ago in Cebu where it became such a huge success that we brought it to a national scale in 2009,” says Mr. David Sarmiento, Jr., the SVP and Head of Auto and Motorcycle Loans Division. “We see the continued and rising interest of Filipinos to have their own vehicles and with a passion to make it easy for them to drive not just vehicles, but their dream cars, we ensure that we give them the best venue and deals every year. This year, Auto Madness goes international as we present the BPI Family Auto Madness at the 7th Manila International Auto Show.” he added. Considered as the largest motoring event of the year here in our country, MIAS also has the biggest exhibition space of any auto show staged in the Philippines. This year, 7th Manila International Auto Show adds the Philippine Trade Training Center (PTTC) exhibition hall to its area, making for more than 24,000 square meters of exhibition space. Filipinos can look forward to more car launches and debuts this year with more than 25 participating automotive brands on hand, special heritage displays and the much awaited, Car of the Year unveiling. This year’s highlights will include the Russ Swift precision driving stunt show, Car of the Year Awards Gala Night, MIAS Custom Classic Car Competition, European Mobile Media competition, Top Gear photo contest and exhibit, 2011 car model launches, special vehicle and automotive heritage displays and exciting raffle prizes. In addition, car buyers who book during the said event will have a chance to win a whopping P100,000 rebates on their car purchase. The BPI Family’s Auto Madness Metro Manila leg will be held at the 7th Manila International Auto Show, and BPI will be bringing back its Free GPS Real Thrills Promo to complement brand new vehicles for personal use with a minimum amount financed of PHP 700,000.00 and a loan term of 36 months. During this grand motoring event, BPI Family Auto Loans will be on hand to give on-site financing help once car buyers find the vehicle that tickles their fancy. Apart from the Free GPS Promo which is pioneered by BPI here in our country, clients also get a free Petron-BPI MasterCard with free fuel and fuel rebates. These future car buyers are also afforded the ease and convenience of onsite approval coupled with flexible payment terms over a wide range of channels such as Express Online, Express Phones, auto debit arrangement, ATM and over the counter payments through BPI branches. 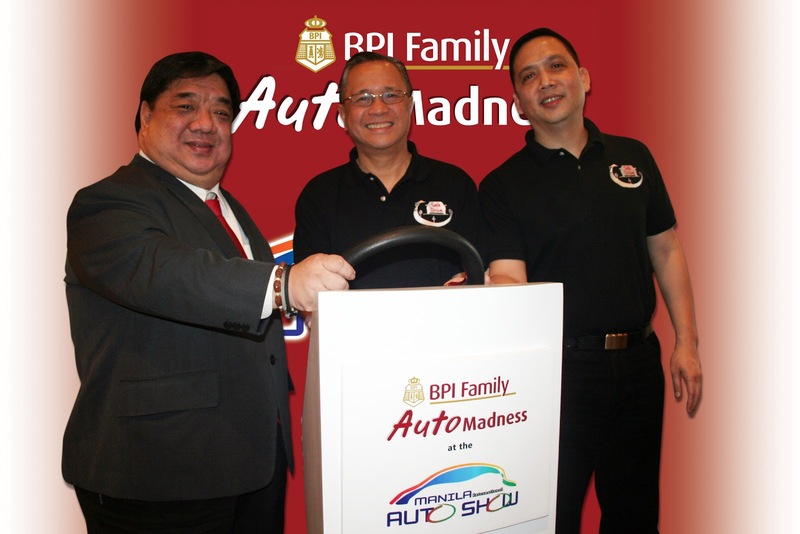 BPI Family’s Auto Madness will also be held at the Ayala Center in Cebu from April 1 to 3, 2011 and at the Lim Ket Kai Mall in Cagayan De Oro from April 4 to 16, 2011. For more information on getting a BPI Family Auto Loan, interested individuals can call up call their hotline at (02) 845-6777 or visit their official website at www.bpiloans.com or, any of the 800+ BPI or BPI Family Savings Bank branches scattered throughout the Philippines. If you can't make it to MIAS, you can still apply at over 800 BPI branches nationwide or at any of the more than 200 participating dealers! BPI Family Savings Bank (BFSB) is a subsidiary of the Bank of the Philippine Islands (BPI), one of the top and leading commercial banks in the Philippines. Formed in 1985 in the merger of BPI and Family Savings Bank, BFSB caters to middle-class families and offers retail banking products and services. With more than 20 years in the business, BPI Family Auto Loans has created its mark and taken a leadership position, continuously providing Filipinos with a complete auto loan solution and guaranteeing ease and convenience in auto loan application through its strategically located BPI and BFSB branches, numbering over 800 nationwide. Founded 17 years ago, Worldbex Services International pioneered the exposition industry by providing companies and end users alike with a venue to showcase their products and services with world-class trade shows and expositions. With eleven shows slated for 2011, WSI is considered to be the premiere events organizer in the country with a proven and impressive track record particularly in the construction, automotive and food industry, among others. WSI continues to establish trends in the exposition industry, bringing the latest innovations, products and services to trade and consumer oriented visitors in the local and international market. It's nice that they take part in this kind of event. I really believe that they offer good services.